Cissus quadrangularis is a succulent vine from Africa and Asia. It is one of the most commonly used medicinal plants in Thailand, and is also used in traditional African and Ayurvedic medicine. All parts of the plant are used for medicine. Muscle Feast’s Cissus Quadrangularis contains the highest levels of total ketosterones and 3 ketosterones available; at 40% and 20% respectively. Cissus quadrangularis is used for obesity, diabetes, a cluster of heart disease risk factors called “metabolic syndrome,” and high cholesterol. It has also been used for bone fractures, weak bones (osteoporosis), scurvy, cancer, upset stomach, hemorrhoids, peptic ulcer disease (PUD), painful menstrual periods, asthma, malaria, and pain. 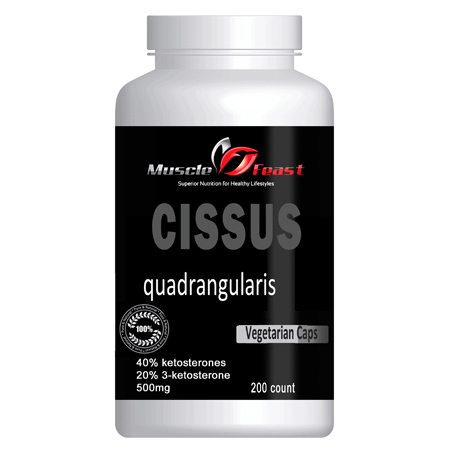 Cissus quadrangularis is also used in bodybuilding supplements as an alternative to anabolic steroids. How does it work? There is not enough information to know how Cissus quadrangularis might work for medicinal purposes in people. Test tube studies and research in animals show that it has antioxidant, analgesic, and anti-inflammatory properties. It might have activity against the organism that causes malaria. More evidence is needed to rate the effectiveness of Cissus quadrangularis for these uses. Some specific commercial products containing Cissus quadrangularis seem to be safe when used appropriately in adults short-term (for up to 6-8 weeks). These products can cause side effects such as headache, intestinal gas, dry mouth, diarrhea, and insomnia. But there is not enough information to know how often these side effects might occur. Since there is not much information about the use of Cissus quadrangularis in people, long-term safety is not known. Pregnancy and breast-feeding: Not enough is known about the use of Cissus quadrangularis during pregnancy and breast-feeding. Stay on the safe side and avoid use.